Magnus Movies an established overseas distribution company is proud to announce that we are adding one more quality film ‘Silly Fellows’ to our list. We have bagged Overseas screening rights of Comedy kings Allari Naresh and Sunil’s comedy carper ‘Silly Fellows’. Bheemaneni Srinivasa Rao who is known for making comedy and concept oriented films like ‘Sudigadu’, ‘Suswagatham’, ‘Annavaram’, etc. has directed this film. Recently released teaser and songs acquired positive responses from movie lovers. The film is all set for grand release worldwide on September 7th and USA premier shows are confirmed on September 6th. Allari Naresh and Sunil are romancing sizzling beauties Nandini Rai and Chitra Shukla in the film. 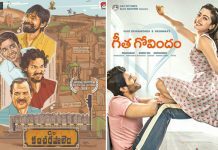 In a recent interview, Bheemaneni Srinivasa Rao revealed that ‘The characterizations of Allari Naresh and Sunil are interesting. They have never played such roles thus far in their career. We thank all the producers Blue Planet Entertainments Kiran Reddy Garu & Bharath Chowdary Garu. And People Media Factory Viswa Prasad Garu & Vivek Kuchibotla Garu for giving this opportunity for Magnus Movies to release this laughter-riot film in the overseas market.